Are you protecting your apartment from meth contamination? When meth is manufactured or cooked, the contamination can easily permeate the fabric of a building. But what if that building is an apartment? Can it seep through and affect other apartments next door? Definitely. We’ve seen cases of this. As the headline above shows, this is something many body corporates are aware of… but few are managing the risk as effectively as they could, putting not only apartment dwellers and owners at risk, but Body Corporates and building managers, who have day-to-day responsibility for the smooth running of properties. We have discovered multiple meth labs since we formed the business in 2012, apartment buildings among those properties that test positive. 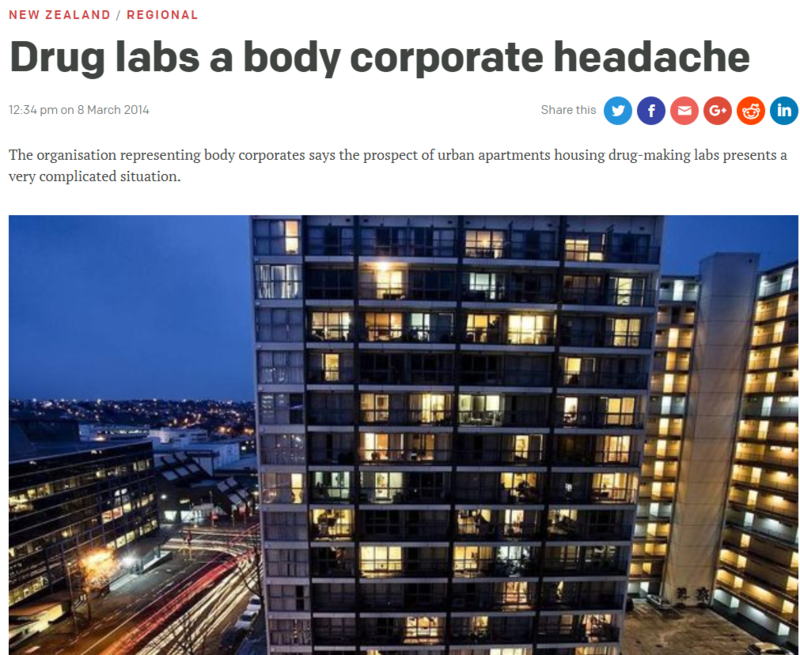 When a meth lab is in an apartment building, not only is the owner of the affected apartment exposed to significant financial losses, there are also real risks to neighbouring apartments. Yet we hear from onsite building managers that many body corporates and management companies are not proactively doing what they can to mitigate the risk of meth manufacture because they don’t perceive the risk to be real. Reality: Around 72% of meth labs located by NZ Police are discovered in rental properties and, according to a Massey University study, 32% of long term meth users will have a go at cooking meth. Meth labs aren’t always the complex science labs people visualise – they can be as small as a thermos flask and able to be transported into an apartment building in a backpack or suitcase without raising any suspicions. They don’t need lots of space – meth can be cooked in an area the size of a cupboard. The risk of cross contamination from a meth lab is likely to impact the adjacent apartments, including above, below and communal areas. 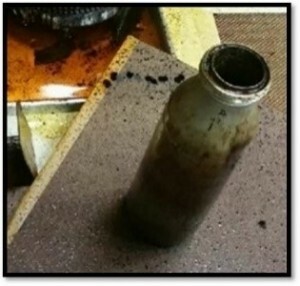 The body corporate insurance company may deal with the contamination as one event – this means one maximum pay-out of $50,000 to cover all damage across all apartments. There may be a cap on the number of insured losses in any one year – some owners may miss out. 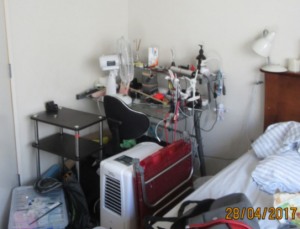 So, what can apartment owners do to protect their assets from meth contamination? MethMinder is a small silent alarm that monitors air quality 24/7, searching for the chemicals used to cook meth and alerting MethMinder HQ real-time if anything is detected. Ideally this device is installed in individual apartments. However, in some cases installation in common areas may be the best all owners can agree on. The device is not only an active monitor for meth manufacture but an excellent deterrent from partaking in meth. The best was of preserving asset value and reducing the hassle caused by meth criminals is to motivate them to live elsewhere. MethMinder contains a long-life battery (it can operate when the power is off) and a SIM which connects to the Vodafone network and communicates to the MethMinder monitoring base. 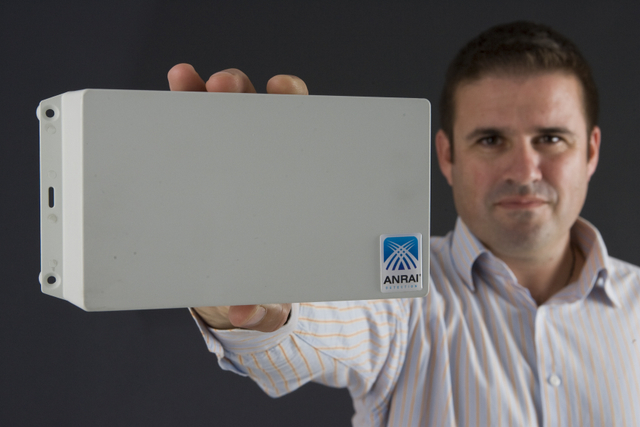 It is also fitted with anti-tamper sensors to detect and deter any interference. The MethMinder technician will visit the site and assess air flow and then install the devices on the ceiling of individual apartments or in communal areas in apartment developments. This provides risk mitigation for owner-occupiers, investors, tenants, the building manager and the property management company. Some body corporates have engaged trained drug-detector dogs. The dog units make random visits to detect illegal drugs on the premises. Dogs are trained to detect illegal drugs such as methamphetamine and this activity is likely to detect drug related behaviour. However, the dogs can only be onsite for random visits and it’s unlikely the dogs can detect the myriad of chemicals used to manufacture methamphetamine nor the vapour and gases emitted during the cooking process. The cost of a drug dog visit equates to around 12-months’ monitoring with a MethMinder device. Owners out of pocket more than $150,000. To find out more about meth-risk mitigation strategies and MethMinder, please call Debra on 0800 638 4522 for expert advice.